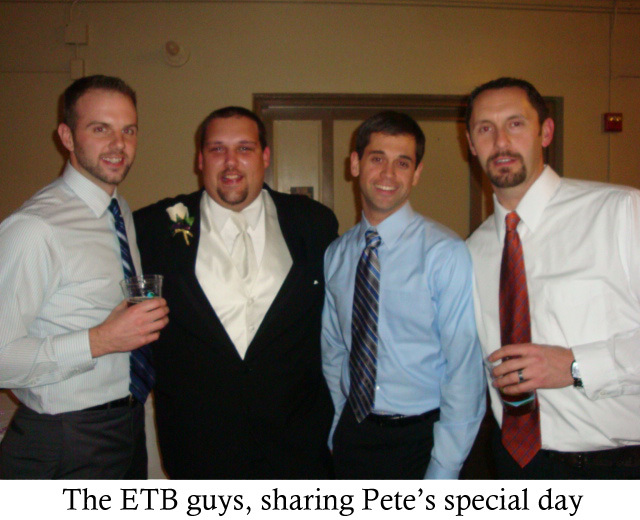 Erik’s Editorial Corner - Collegeville, Conshohocken, King of Prussia, Malvern, Reading | ETB Services, Inc.
December 16th, 2010 ETB Services, Inc.
We are happy to announce our one and only Pete has tied the knot! (See happy photo below) As I listened to the happy couple say their vows, committing to support each other, it reminded me to think of all of the people that support all of us throughout our lives. Perhaps you are fortunate to have a loving family… A wife or husband, kids, parents, and siblings. These are the people that have stood by you through thick and thin, supporting all of your successful endeavors and maybe even a couple of failures. This is also a great time of year to remember the other individuals who offer their support in a more subtle way... The co-worker that always listens when you rave about your grandkids, the administrative assistant that ensures you never miss a meeting, or the employee that always shows up on time every Monday morning with a smile! 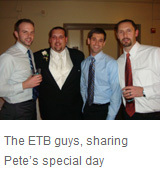 The group of people WE want to thank is YOU – our customer. You have helped shape and grow our business into a place we enjoy working in every day and we truly appreciate your support. Happy Holidays to you and your families and make it a great day!